Oh! You again. Well, you’ll notice I’m back to being little, old, non-froggy, normal me. So, no point reading on because this book is very, very boring. The little monster character from Do Not Open this Book is back, and back to his normal self, but he really doesn’t wanting readers opening the book, or turning pages. He tries everything to stop the pages being turned, finally revealing why: the wizard who turned him into a frog last book has fixed him – but if the end of the book is reached, he will be naked. This laugh out loud, interactive book will delight young readers, and will be requested over and over again. With text by Andy Lee (best known as one half of Hamish and Handy) and digital illustrations from Heath McKenzie, Do Not Open This Book Again is good fun. was a nervous little owl! A very hungry dragon meets – and eats – a series of unfortunate animals: the owl, a fancy fox, a muddy pig, and more. But eventually he feels sick and a visit from the doctor is needed. When the doctor, too, ends up in the dragon’s belly he figures out a way to get the dragon to spit them all out. the dragon feels better – and has learnt his lesson. This humorous rhyming picture book will have kids laughing out loud and saying ‘gross’ in equal measure, but whilst animals are eaten, there’s no blood or gore, and every one is fine at the end. The dragon, in gentle reds and pinks, with tiny wings and big round eyes looks silly rather than fierce and the looks on the various animals’ faces as they realise what is happening adds to the humour. Oh! You opened the book. I assume that was an accident? Just PLEASE don’t turn the page. A zany long-legged egg-shaped blue monster is the star of this book, pleading with the reader first not to open the book then, with increasing desperation, not to turn the pages. he tries threats, pleas and even ignoring the reader, until, on the second last spread, he reveals that a witch has threatened to turn him into a frog if any one reads all the way to the book. Young readers and listeners are invited into the story. to participate either by turning the page or by telling the adult reader whether to or not to do so. I read this book to my three year old grandson who, after one page, was urging me to ‘turn the page’, and demanded repeated rereadings of the book. Illustrations, by Heath McKenzie, focus on the narrator, with big eyes, long limbs an an expressive mouth. Text features including bold, caps and shaped text to emphasise emotion, as well as a mix of white space and backgrounds including red when he is particularly angry, as dark grey when he is desperate help to build tension as well as humour. Great for toddlers and early readers. Autumn had arrived at Pomona Orchard, where Maddy Sharpe and her family lived. The days were getting shorter and darker and the leaves on the peach trees were turning brown and drifting to the ground. Maddy had noticed that other things were changing, too, like her pony’s coat. A few days ago, Snowy’s coat had been short and smooth. Now it was as long and thick as a woolly mammoth’s. Maddy loves her pony, Snowy. She loves learning to ride and everything to do with having a pony, even though it can be a lot of work. She particularly loves her weekly riding lesson at Pine Valley Ranch. She wonders if she’ll ever be as good as her friend Iris Digby. But Alita Jessup is harder to love. Alita is a show-off in class, with her fancy gear and her shiny boots. She is sure she knows better than their teacher, Pattie, and often disrupts the class with her comments and behaviour. This week, six foals are to be weaned, separated from their mothers, and everything needs to be calm and in control around the ranch. But one of the foals, Sunny, isn’t quite ready to be separated from her mum. Each page has a border featuring riding essentials, and black and white illustrations are scattered throughout. Cover art is in pink and shiny purple. Throughout the text, some words are picked out in larger font and bold. 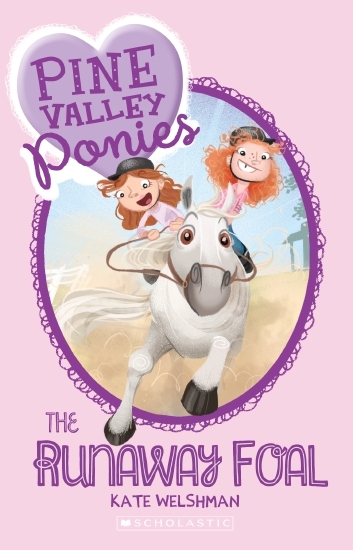 ‘Pine Valley Ponies’ is a new series from Scholastic, aimed fairly and squarely at horse-obsessed girls. Whether they have their own pony, or they wish they do, they’ll be able to discover the joys, challenges and responsibilities of horse ownership. Maddy admits to anxieties about each new stage of learning to ride well, while being keen to discover more. She explores friendship and struggles to understand the attitudes of show-off Alita who doesn’t always seem to have her pony’s best interests at heart. She watches others and tries to emulate them, but also displays empathy and bravery when they are necessary. Recommended for newly independent readers, particularly horse-mad girls. Maddy looked down at her pony’s mane as they walked along dusty McClymont’s Road. It was the whitest mane she’d ever seen. ‘That purple shampoo really worked, Snowy,’ she told her pony. Snowy’s ears flicked back an dhe tossed his head. As Maddy’s little brother says, Maddy has everything she ever wanted: a pony for her birthday and riding lessons for Christmas. Even though he’s an annoying little brother, even Maddy has to admit he’s right. But although she loves Snowy, her pony, she’s finding her first riding lesson hard. For lots of reasons. One: another rider in her class, Alita, seems determined to attack Maddy’s riding, her riding gear and her care of Snowy. Two: her mother used to ride here and Maddy’s sure she’ll never measure up and three: the riding lesson is much more difficult than she imagined. Then there’s the ‘forbidden trail’. Each page features a border of riding gear, and black and white illustrations are scattered throughout, breaking up the text. Cover art features a heart containing the series title and is pink and shiny purple. 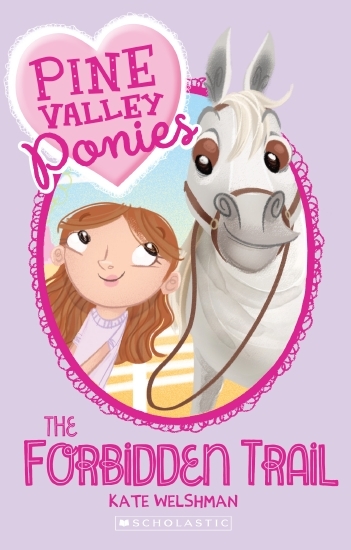 Pine Valley Ponies: The Forbidden Trail is the first in a new series of chapter books from Scholastic, designed to appeal to young horse-loving girls. Horsey language is threaded through the adventure as are care and riding tips. Themes include friendship, bravery, resilience and more. Maddy makes a new friend in Iris, and also notices that the troublesome and superior Alita isn’t as confident as her fancy clothes and beautiful horse would suggest. She might have all the financial advantages, but her life isn’t without its trials. Maddy is a grounded and empathetic character, even when she’s approaching new challenges with trepidation. Recommended for newly independent readers and horse-mad girls. But, while all the other sloths liked to flop and snooze and sloth about, Archie liked to leap and swing! He liked to move and groove! But he was the only one. It’s widely known that sloths are –to be honest – slothful. They don’t have any energy and they don’t mind a bit. They sloth about all day and all night. Except for Archie. He likes to leap and swing and move. He tries to get his friends to join in, but they don’t want to. What’s worse, they tell him to go away. In the deepest corner of the jungle, Archie makes friends with other animals who are different – a white zebra, a short giraffe, an elephant with a small trunk, and a hyena who doesn’t laugh – but Archie misses the other sloths. When he goes home to see if they will take him back, he discovers they are in danger. And it is his energy that will help them. Archie is a comical, warm-hearted book about difference, and friendship – and sloths. The text is laugh out loud funny, but the illustrations are simply sublime. Archie’s expressions are adorable and the supporting cast is bought to life with humorous detail. Will be loved by adults and children alike. Tiny Timmy desperately wants to make the school soccer team. He tries hard to show the coach what he can do – but he keeps getting tackled, tripped and bumped. When the team sheet goes up, Timmy is on orange duty. Coach tells him that his problem is his size – but encourages him to keep practising. So Timmy plays soccer and practises his skills at every opportunity. He also tries to figure out ways to get taller. But it is when he discovers that he has a special skill nobody knew about, that he finds a way into the team. 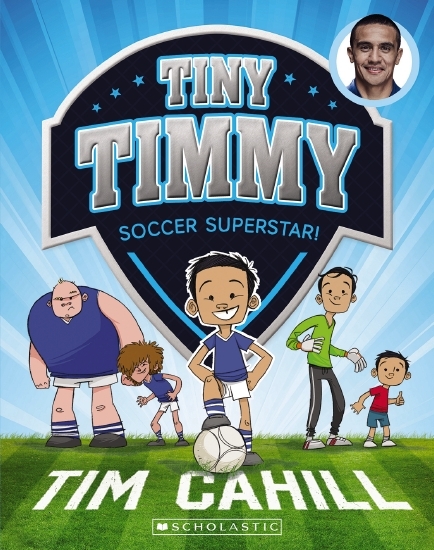 Soccer Superstar is the first in in the Tiny Timmy series written by Socceroos legend Tim Cahill. For young soccer fans, or anyone who loves humour and action, the story blends funny moments with sport and personal discovery. The text is accessible with good sized font and embellishments, and complemented by comic style illustrations by Heath McKenzie. A strong start to the series. A small, very active and noisy boy wants to be a dinosaur. Fortunately, a dinosaur overhears him and helps teach him the things that he must do to be a Great Big Dinosaur. He teaches the boy how to roar, stomp and eat. In turn, the boy teaches the dinosaur what it is to be a little boy. Illustrations are loud and enthusiastic and full of energy. Text types also show that this is not a quiet book. Endpapers offer more traditional dinosaurs, with the endpapers suggesting some behaviour adaptations once dinosaurs have communed with little boys! Many young children, particularly boys, go through a dinosaur-obsessed period. 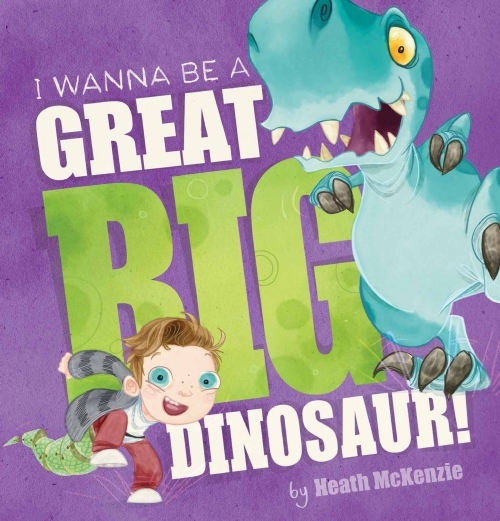 I Wanna be a Great Big Dinosaur!captures just how loud and wild and exuberant this can be. But it also reminds young dinosaur-wannabes in a very gentle way that there are things that are very enviable about being a little boy. Mostly though this is just a joyous romp through childhood. Sure to become a favourite of pre-schoolers everywhere. With white fur, blue eyes, and a diamond-studded, pink velvet collar, Misty wasn’t your typical alley cat. Dingy Litter Alley in the backstreets of Felcanham was the last place you’d expect to find a cat like Misty. She padded along between the rows of rubbish bins, taking great care to keep her paws well away from the dirty puddles on the ground. And with every step she took, the feeling that she was being watched grew stronger. A sudden noise behind Misty made her stumble. Her front paw slid into a puddle, splashing muddy droplets all over her fur. She looked at the browny-black spots in horrow, then saw something even more frightening. From the shadows between the rubbish bins, ten yellow eyes were staring at her. Kitten Kaboodle is a secret agent, not content with a normal cat life. He’s the go-to cat when there are mysterious disappearances. This time, it’s pedigree kittens that are vanishing and it’s up to Kitten Kaboodle, No 1 agent for CAT (Clandestine Activity Taskforce) to sort out what’s going on. He goes undercover as a pedigree kitten and allows himself to be kidnapped (kit-napped?) by DOG (Disaster Organisation Group). He discovers their dastardly plan despite nearly giving himself away with his awesomeness. There are black and white illustrations throughout giving ‘face’ to the myriad characters and breaking up the text. 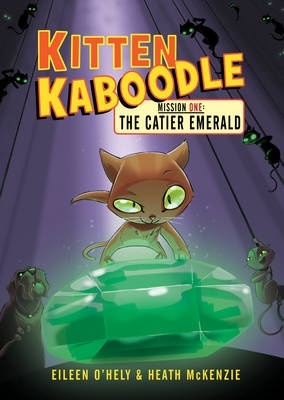 ‘Kitten Kaboodle Mission One: The Catier Emerald )’ shows just what your pet animals get up to when they vanish in the night. Cats work alone, mostly, and dogs act in groups. Cats are bright, dogs have grand plans but are not as smart as they think they are. Non-pedigreed and non-pampered animals are likely to be more resilient than pampered pedigrees. Lots of fun and puns wrapped up in an over-the-top mystery about a famous diamond. Young independent readers will enjoy this exploration of the secret lives of animals, which references the style of many classic whodunits. Heath McKenzie’s illustrations combine the cute and the clever in each cat, and the comic brutishness of the enthusiastic but not-so-bright dogs. Recommended for lower- to mid-primary independent readers. Toby, the boy from across the road, joined in. Marmalade peeped out in surprise. Ella, Maddy and Marmalade the cat love to play together, but when the boy from across the room tries to join in, he gets in the way. He knocks down cubbies and smashes sandcastles. He even pats Marmalade the wrong way. Ella and Maddy are not impressed, but Marmalade enjoys the tummy rubs. Then, when Toby’s attempts to help with a new sand castle scare Marmalade up a tree, it is Toby who has the solution. A New Friend for Marmalade is a picture book story about friendship and acceptance. A companion book to A Year With Marmalade, it is just as beautiful as the first, and can either stand alone or be read as a sequel. The message of acceptance is gentle, and the whimsy of the resolution will appeal. This is an exquisite picture book. You can see an interview with Alison here.